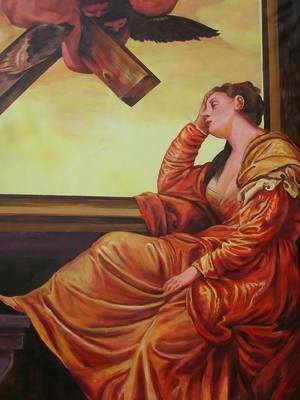 HIGH PRESTIGE EXHIBITION STANDARD VERY LARGE OIL PAINTING "The Vision of St. Helena" A rendition after the High Renaissance Artist Paolo Veronese. BY THE FABULOUS ARTIST DAVID ALDUS. Highest price received for one of his paintings is £20,000. "Trafalgar" Absolute investment opportunity! Pictured is St.Helena of Constantinople who is believed to have had a vision of the cross on which Christ was crucified while she was sleeping. As the mother of the Christian convert Emperor Constantine I, Helena is said to have received divine powers to assist her search for the burial location of the true cross. The "Vision of St.Helena" adds an element of humanity to the saintly reverie by painting her in a relaxed pose within a domestic space. Yet the lush colours, sumptuous folds of clothing and marbled interior are typical of the richly decorative nature of Veronese's original work. This feeling of decorativeness is enhanced by the playful presence of 2 winged putti seen through a wide window floating in a delicately coloured sky while carrying a heavy wooden cross!!! David Aldus the artist has exhibited with the Royal Society of British Artists ( R.B.A ); the Royal Institute of Oils (R.O.I); and the Royal Society of Marine Artists (R.S.M.A) He has been nominated twice as a finalist in the Garrick/Milne prize exhibition held at Christies LONDON. His work has been selected for the Discerning Eye Exhibition by Art Critic, Edward Lucie Smith, where all his work was sold. At the same Exhibition he was awarded a special commendation for his brushwork. He also sold all his work at the Lambeth Palace when exhibiting under the auspices of the Royal Society of Marine Artists. At the Westminster Central Hall United Artists' Exhibition he won first prize for the best Oil painting!! Highest price received for one of his paintings is £14,000. "Lot's wife" see davidaldus.com . This painting was the same size as Turner's Hannibal crossing the Alps 5 foot by 8 foot. David Aldus also sold "A tribute to the people of Malta" that sold for £10,000. The same painting was the subject of a congratulatory letter from Queen Elizabeth II. Lord Lewin, Admiral of the Fleet also sent a letter of congratulations. He has held one or two-man shows at Knightsbridge; South Kensington; Windsor and numerous other venues. He has exhibited in Westminster Central Hall; Royal Festival Hall; Birmingham’s Royal British Artists exhibition; Victoria Art Gallery, Bath; Rooksmoor Gallery, Bath; London Guildhall; Mann Island, Liverpool; Christies, the London Auction House, etc.